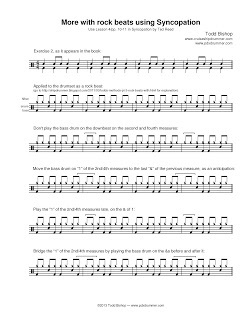 Going a little further with my earlier piece on making rock beats using— say it with me— Ted Reed’s Syncopation. In doing this, there will be many duplicate beats, but that’s not important— our purpose is not to create new beats, it’s to apply a thought process: taking a melody line, converting it to a drum beat, and then doing basic modifications to it. It’s the beginning of playing with creative control over what you are doing, rather than just playing familiar beats. It’s all simple enough that most people will internalize the concepts quickly, and begin applying them purely instinctively. Be sure to review the previous thing first, and be able to play it with Reed Lesson 4 (pp. 10-11 in the old edition), #1-15, straight through without stopping. 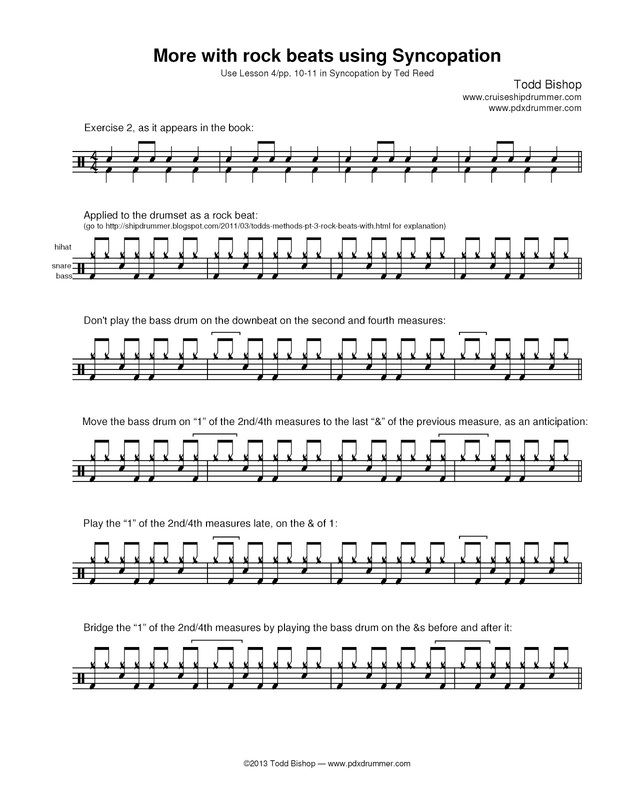 The current exercise involves shaping your phrases by doing things with beat one of the second and fourth measures— omitting the bass drum, moving it to one side or the other, or bridging beat one by playing on both sides of it.